The Birmingham Pals may be booked for events across the country. Our standard fee is £300.00 per day. Blank ammunition and pyrotechnics, if you require these, attract an additional charge to cover the cost of these items. All members taking part in firing displays hold the appropriate legal documents - A Firearm Certificate for Section 1 firearms or a Shotgun Certificate for shotguns. These are issued by the member's home Police Force. Members of the group who do not hold these documents may take part in arena displays using either de-activated firearms or replica firearms which do not require certificates. As a part of our Living History display we may exhibit firearms of the period. Only de-activated firearms may be handled by members of the public in line with Home Office requirements. Live firearms will be secured whilst on display. We are a "not for profit" group - the fee covers on-going expenses such as group equipment purchase and repair, expenses, and Public Liability Insurance. We may be able to offer reduced rates depending on the type of event, and other factors. We may be able to waive our fees completely in certain circumstances - contact us to find out if your event qualifies for a fee reduction. 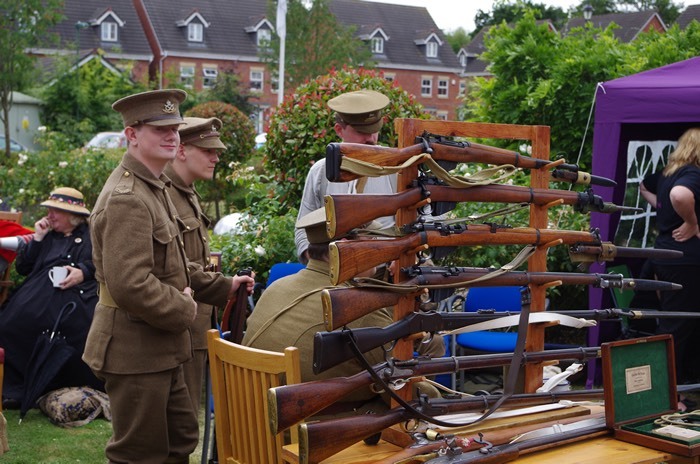 The Birmingham Pals are the Resident Re-enactors at The Staffordshire Regiment Museum, and support their events whenever possible. A list of the Museum's events are included in our events list. Please note that a non-returnable deposit of £50.00 per booking is required before a booking is confirmed. This will be deducted from the outstanding balance due. In the case of an event where our fee is less than the deposit we will refund the balance. We regret this has become necessary, but it is due the large number of bookings which have been cancelled at short notice. Full details will be provided when a booking enquiry is received.